It is 2.20 a.m of 12th Oct, 2009. Last night, I completed my previous article after revising and editing it on how to make our mind firm and steady. I had to conclude the article so that I could go and spend some time in Pondicherry in meditation and reflection for reviewing my growth and come to a decision where to set off from there. And by the time I would return, the next article should be ready before 30th to make an entry of this month. I was contemplating upon all this and well, also on what I should write next. I kept in mind Swami Dayananda Shaligram of Ganeshpuri, whose nature is omnipresent and who is my constant spiritual companion, to assist and guide me in this serious effort and continuing endeavour of mine. I also thought in the direction of this- That the next post should be related to practical life skills and it should not be very introspective in nature and full of gravity for the time being, at least. Thinking hard of all this, I fell asleep last night. These days my mind is most of the time engrossed in pondering, in keeping up with and updating my blog and thereafter in practicing what I write for all of us. My eyes opened at 2.20 a.m. sharp and I came to a wakeful state and found myself speaking these words clearly- ‘How to make your life extra-ordinary from ordinary’. I was bewildered and amazed to see what I was muttering to myself and wondered why. The next moment I became fully aware that I just got over with seeing a vivid, meaningful dream. Or rather I was being told telepathically through the medium of a dream, in which I was guided by Swami Shaligram what to write in my blog and that was what I had just uttered. And then, it took me a few moments to walk in the past and recall what was the last thing that I thought about before I slept as this incident must be a continuation of that deliberation. I had become fully awake by this time and decided that once I get up at 6 in the morning I will bring together and compile what I had experienced. However, revered Shaligram Swami did not allow me to sleep, instead he told me to start penning down what he was about to make me write right there and then!! He clarified that this article is for my daughter, Mandira who is blooming beautifully in every manner but needs some special guidance at the moment. So I heeded his well timed advice and obeyed him and took out my pen and register in the dark and then got up to put on the light. I sat up and opened a fresh page. The flow of words and sentences trickled and flowed on its own, effortlessly from 2.20 to 4 a.m. in the morning as I allowed his thoughts of practical wisdom and judicious advice flow through me. I did not tire neither did he, until this post was composed in one go. When I was over and done with it, I saw the time. It was exactly 4 a.m in the morning and before I left for Pondicherry, the draft of this particular entry which you are reading at this moment was ready. I was thankful and relieved at the unexpected turn of events of that morning. 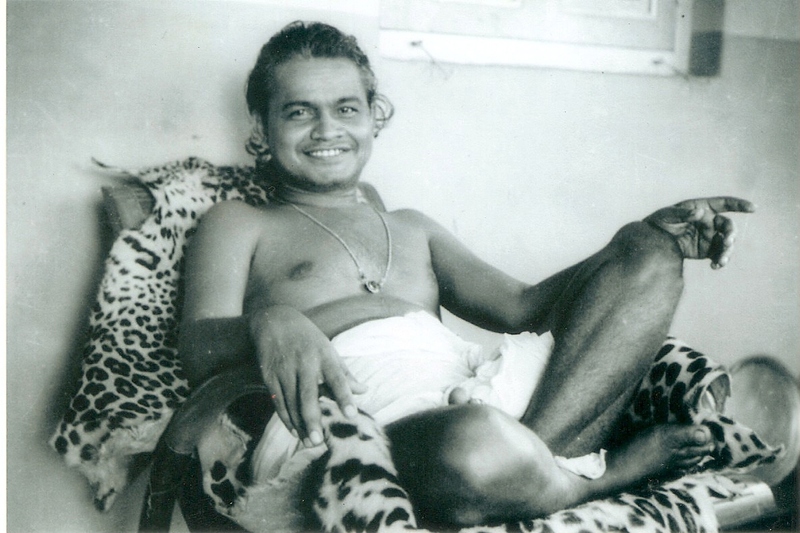 For your sake, I would like to inform you that Swami Shaligram, Swami Nityananda’s recluse, yet foremost disciple who shunned public gaze, set an example for all the devotees when he was alive by dedicating his life by setting an example of an ideal disciple to his guru, Swami Nityananda. He was an epitome of devotion, surrender and self- giving. He took birth with only one mission- helping the poor and needy people and to show the sadhaks or aspiring seekers what an ideal disciple should be like. He was like what Arjun was to Lord Krishna, a perfect disciple. No wonder Mahavatar Babaji has said these words about Swami Shaligram- “Voh mera laadla beta hai”. He is my very dear son! Believe in your destiny Don’t doubt your destiny which is a very big force which we carry in an embryonic state within us. Whatever we are supposed to have or get in life in future, we will definitely get and acquire in a fixed course of time. So why lose hope and have doubts in our power, abilities, or capacity to do something? Instead put all your energy and focus on achieving what you desire for. Now why do all genuine saints ask us to believe in our destiny, one may ask or at least the atheists may ask me. Confidence in your destiny gives you sense of satisfaction and contentment or else feelings of discontentment, jealousy and hopelessness are nursed. If you have a firm belief that whatever life has pre-decided to bestow on me, I will surely get one day, no one can take that away from me, you will have no fears or concerns and will never be overwhelmed by mental worries and anxiety. On the contrary we are sure to stay calm and we will move towards our set goals. Lord Krishna was destined to become the king of Mathura, no matter how many attempts were made by Kansa to kill Him but he was unsuccessful in his wicked attempts. Have patience Cultivate patience, not little but a lot of it. Extra ordinary people are blessed with this great quality. Believe in yourself that you will be able to achieve what you have set your goals for but that will take time. Until that manifests, you must put up with every effort and that too very consistently. We tend to forget that when we do not achieve results after making many attempts at something , only patience helps. In normal circumstances, what we do is try to do a bit of something then lose hope and eventually give up. For some results we have to work harder as it takes longer than normal to get desired results. So be it!! Achieve your aims and goals with untiring patience . Lord Rama never gave up and had unending patience when he set out to find his abducted wife, his beloved consort, Seeta. He searched for her everywhere in the forest and in plains. And being the king of Ayodhya, he did not hesitate to ask for help from anyone whether they were animate or inanimate, high or low, rich or poor, known or unknown. He worshiped the sands of seashore of Indian Ocean and also to Lord Shiva after the battle in Lanka until he achieved what he had set for!! Be persistent Whenever I think of persistence, I think of ants. Ants never give up and they carry such big loads on their head and to me they never seem to be getting tired of doing the same job all their lives. When they walk up, they fall umpteen times. They never say that it’s not possible to reach my destination because I keep falling. Instead, they create their own path and walk on it. You try stopping an ant who is carrying a grain of sugar up the hill you will understand what I am saying. It will never stop and instead it moves in another direction and keeps moving up. If there are people who are blocking your path, don’t complain, cry or sulk, just carve out a new path and walk in a new direction. Carve out your new destiny by being very persistent in your efforts. Persistence really pays. No matter how long it takes to get results, months or years, put in your efforts on a regular basis until you get what you want in life, it could be physical, material or spiritual in nature. To make our lives better and progressive material gains are also needed. Be determined By being determined, we remain focused in our endeavours. If you are determined, you will become fearless. Determined people are afraid of nothing, not even death. They face everything that comes in front of them, they address it and move on. There are going to be problems in between, there will be short periods of darkness, you may sometimes feel hopeless but it does not matter. Be determined and rise once more and do not rest until you have achieved what you had set out for. There are many people out there who have set up their big business houses, companies, ventures and other establishments who had no help whatsoever but they were determined to pursue to follow and chase their dreams and goals. Great athletes and sportsmen, mountaineers, climbers, freedom fighters are also people with extra ordinary determination and therefore achieve extra ordinary feats. Control your mind and speech People who have regulated speech can control their mind easily. Our speech should be full of meaning and worth. Senseless words, senseless talking and senseless thinking depletes our energy and stops us from exploring our optimum potential. Learn to conserve energy by talking less and thinking more. A lot of energy is wasted in worthless conversation for the heck of it. Limited talking will give us more time to contemplate and meditate. A scattered and restless mind can never achieve anything big and extra-ordinary. Try to meditate to make the mind calm, strong, powerful and dynamic to achieve whatever you want to achieve and pursue an enriching, enhanced and superior life. To extrapolate and break all limitations of mind and body, be conservative in talking and do not spend your precious energy in fruitless interactions with people. Save time for yourself to nurture, conserve and mould your life in extraordinary ways. People who speak less and meaningfully have the power to have an impact and can change other people’s life in many areas. So control your mind and control your speech. They both are interrelated. Be courageous If you look at the life of Panchali, she was one woman who was very courageous. She did not fear anything and always spoke the truth without any hesitation. She was bold enough to tell Bhishmapitamaha, the senior most member and head of the entire lineage, that he had no business to be called Pitamaha and the caretaker of Hastinapur if he did not have the courage to stop the Kauravas from insulting and disrobing her in public. She had the courage to go bemoaning to Dhritrashtraand tell him that as he had kept mum during such an ill-omened hour, ominous fate would fall on the next generations of Kauravas. She feared nobody in the huge hall where there were only men and no woman to be at her side at such a critical time. She also decided to be on the battle field for those 18 long days at Kurukshetra till the war was over to make sure no Kaurava survives the wrath that they had called upon themselves by their own misdeeds. In the camp, she would nurse the soldiers and falling kings to the ground. She saw the gory of death and destruction and waited for Pandavas to bring the war to an end. After the war, like Pandavas, she too relinquished Hastinapur and chose the cold and arduous Himalayas to bring the chapter of her life to a close. All along, she chose to be with the Pandavas uptil Swarag Rohini peak, near Alaknanda river in the mighty Himalayas, next to today’s Badrinath temple where one by one, the Pandavas laid down their lives willingly as repentance and penance for the war they had fought so unwillingly!! History pays tribute to that bold and courageous woman even today. Women can achieve and accomplish anything and make their lives extra ordinary if they want to, provided they possess or cultivate boldness, courage, forthrightness and fortitude. So cultivate that and fear nothing in life. Judge your life by its quality It is in our nature to judge ourselves by comparing ourselves with someone else who has become something or seems to have achieved much more than us in terms of success and material gains. But my dear child, I do not view and judge myself on this criteria. This is not the bench mark for me to judge people. I agree that there are many people whom I know are much more successful and are wealthier than I am in terms of career, success and wealth. Good for them!! I am not missing out on anything, I am very positive about it. On the contrary, I consider myself to be more fortunate than all others because I am able to connect to God anytime I wish to, I have my own contacts and connections! Do they have that? I have peace in my life. Do they have peace of mind? I have joy in my life. Do those people have joy in their life or are they in delusion and misery of some kind? I have contentment and satisfaction. Do the very rich and visibly famous have contentment or do they crave for more? I have unshakable faith in God. Faith that has helped me to navigate in the darkest hours of my life. Do you have sufficient faith and believe in God and his mercy and Grace? And if yes, then you are a blessed one and a chosen one!! Judge yourself and your life by the ‘quality of life’ that you are leading and not by the amount of material you are consuming, not by accumulating heaps and heaps of notes, gold and silver, owning estates, or if you have 200 people working under you. Think!! Change your definition of rich, beautiful and successful. Only a true spiritual man is happy and successful in life. Someone who has understood the mystery of life, someone who has solved his complex human mind problems with the help of deep connection with the Almighty God, who has understood that this world is a temporary residence where we are supposed to give more than we take, who never looks back and does not even count his innumerable good karmas. Someone who is always rejoicing without getting any gain or success, someone who forgives all in spite of their ill temper and behaviour and someone who loves to pray and talk to god is a blessed soul. Such a person is extra ordinary, he is special, his life becomes extra ordinary. So judge your life and yourself on this criteria and now make your life extra ordinary. It is not the number of years that we live, but the quality of life that we spend here. At this moment while explaining, I remember Abhimanyu, the star of Mahabharat. He was barely 16 years old when he died an unfortunate and tragic death in the hands of capricious and wicked Kauravas. But he did a spectacular job by tilting the fate of the war. He helped the Pandavas in the war by not allowing Dronacharya, who had vowed to kill Yudhisthir after the death of Bhishmapitamah, either by capturing or killing him and hence bringing the war to an end in their favour. Though Abhimanyu was such a young lad, but his contribution towards Pandavas and the human society at large was huge. He took on the responsibility of changing the course of the war and has created a place for himself in history for heroic, dauntless courage. So who lives better and how? People who have a sense of awareness and consciousness or people who are awake all their lives and live each day in awareness, wakefulness and gratitude are the ones who live their lives truly well. You are currently browsing the Spirit in life blog archives for the day Sunday, November 1st, 2009.